Debra Gould has trained over 4,000 students in the techniques she learned staging hundreds of homes. She has Graduates as far away as Australia, New Zealand, Europe, UK, Brazil, Barbados, Israel, The Philippines and South Africa. If you're creative and love decorating and are considering starting your own home staging business, Debra can save you months, if not years, of trial and error by sharing the techniques she's learned along the road to building Six Elements Inc., her own successful home staging business. Read on to see how she got started. I am an internationally recognized home staging expert, president of the Voice of Possibility Group, and the creator of the Staging Diva Home Staging Business Training Program. An entrepreneur since 1989 and author of several guides, I have staged millions of dollars worth of real estate through my company, Six Elements. 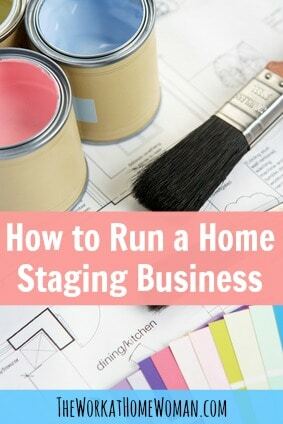 After appearing on HGTV and in major newspapers and decorating magazines across the US and Canada, I started getting emails from hundreds of women who had taken home staging courses and hadn’t figured out how to make a living. That’s when I realized, no one else was teaching the business of home staging and the Staging Diva Home Staging Business Training Program was born in 2005. I’m proud that I’ve now trained over 10,000 creative women in 23 countries on how to earn a living from their own talents. I give them a comprehensive business model and template to follow, so they can save time and start earning money from home staging and redesign faster and with less effort. I have lived in 4 different cities, raised a child on my own, and supported myself from a home office during all that time. My latest hobby is Stand Up Comedy, and I’ve performed for crowds as large as 350 people. I have a BA in Communications and an MBA in Marketing. I have no interior design or decorating training. But I’ve been decorating since I was a little girl. First, by creating my own Barbie house and all the furniture, later with my own bedroom, and beginning in my late 20s with ugly homes, I would buy, decorate, and flip. I decorated 6 of my own homes, so that they would sell fast and for more money, even before I knew this was called home staging. I continue to invest $10,000 to $15,000 a year in my own training so that I can share the best of that with my Staging Diva students and coaching clients. They know that I’ll keep them informed on all the latest things they need to know about business, social media, websites, and marketing. What are some of the challenges faced by Home Stagers? Knowing how much to charge for your services and how to communicate that in the right way, so your clients aren’t trying to haggle for lower prices. Knowing how to attract the right clients who value what you offer and don’t mind paying a premium price for it. Making sure you get paid when your services are performed rather than at some far off date in the future. Minimizing paperwork and complications so you can spend more of your time on the creative side of the home staging business. These are all things I struggled to figure out during my first year in my home staging business. I put everything I learned into the Staging Diva Home Staging Business Training Program, so my students don’t have to figure all this out the hard way. I give them a business blueprint to follow so that they can get their staging business up and running quickly. What types of services and products do you offer? I continue to offer home staging, redesign, and color consulting services through Six Elements. The bigger part of my time though is running the Staging Diva, an international training company. I offer courses, teleseminars, guides, checklists, monthly group coaching (that’s been called the “Water Cooler for Home Stagers”), one-on-one Business Accelerator coaching, Staging Diva Network – an online discussion group for home stagers, a home staging job board, Home Staging Business Report, and more. You can find the full list of home staging resources here. I landed my first home staging client from a combination of marketing efforts. I had just moved to a new city, and no one knew me. I was a single mom with limited funds so that I couldn’t spend any money on marketing. I did a combination of things to “burst on the scene” in a key neighborhood that had lots of home sales. First, I approached a real estate agent to offer a free evening workshop in exchange for her promoting it in a newspaper ad and door-to-door flyers. I also showed up and introduced my business at local networking events, and sent a well-written press release to the community paper (which they used word-for-word). I also built my own home staging website using photos from my own home. These are only some of the things I did and were part of an integrated marketing plan like I share with my Staging Diva students. My first home staging project was worth $5,000, and that gave me the proof I needed to keep going with my staging business. Marketing is one of my superpowers. I was interviewed twice by CNN in my first 18 months as a home stager, was profiled on the front page of the Wall Street Journal’s Home section, and appeared in countless newspapers and magazines, radio shows, and even on HGTV, that was because of my marketing expertise. I know how to build a business from scratch, and keep at it until I have traction and momentum. I’ve been supporting myself from a home office (in various businesses) since 1989. That was even before the Internet, cell phones, email, and all the other things that make it so much easier to work from home today. How are you currently growing your home staging business? I don’t need to actively promote Six Elements anymore. My website and referrals keep home staging projects coming my way. In fact, I have more projects than I can handle, and instead, tele-seminarsrefer them to my Staging Diva Graduates. I offer the only home staging job board in the world. There are currently over 400 home staging jobs posted for the US, Canada, and international home stagers. To grow my training business, I continue to write articles and do media interviews in the US, Canada, and Australia. I also offer free reports, teleseminars, so that potential students can get a sense of what they're learning with me. The best way to get started if you’re thinking of becoming a home stager is to find out if you have the eye of a home stager. You can test your staging savvy with the free quiz I offer at StagingDiva.com. You’ll get ten photos of what my client’s homes looked like before I staged them, then you can see what you’d change and check your answers against what I actually did. It’s a really fun way to see if you have a natural talent for a home staging career. For women who are interested in this career — how much time can they expect to spend in their home office vs. outside with clients? Home staging is not a full-time job. It fits easily around raising children or anything else you have going on in your life. With the right pricing strategy and business model, you should be able to earn in a single day what most people earn in a week working full time. How many hours you choose to work with clients is entirely up to you, and how much money you want to make and what your other priorities are. When I started my home staging business, I was raising a child on my own with no family around. She was only seven years old, and it was critical to me that I could walk her to and from school every day and not work evenings or weekends. I struggled quite a bit in my first 18 months because I was figuring out the right business model the hard way. Testing out different marketing and pricing strategies. Within my second year, I was earning up to $10,000 a month from my home staging, color consulting, and redesign services. This included passive income; I also earned on furniture rentals, repairs, and painting. At that time I was seeing anywhere from one to five clients per week, so I was out of the house anywhere from 3 to 30 hours a week. What I liked about it was that I could control how many hours in any given week, based on my family demands. During the summer months and holidays like Christmas and March break, I barely worked at all because my clients were away too. How much time you spend on your business from your home office will depend a lot on how much time you want to devote to marketing. Because the Staging Diva® business model doesn’t require any inventory, unpaid business hours are dramatically reduced. There is no time wasted in managing, caring for, storing, paperwork for, or transporting goods to your clients. I handle all this with outside companies and still earn a commission on this, something I share with my students. This keeps my hours down and my profits up. Overall, I worked anywhere from 10 to 40 hours on my business per week, depending on my goals at the time and much of that time was from my home office. What advice do you have for other women who want to start their own Home Staging Business? Don’t fall into the traps of offering free estimates or buying your own inventory. Neither of these are necessary when you’re following the Staging Diva® home staging business model. Don’t fall into the trap of thinking you need official “credentials” to become a home stager because there is no such thing (contrary to what many companies offering courses will tell you). Home staging is a completely unregulated industry, so it’s important to research any company you are thinking of buying training from. Also Google the person who will be teaching you to make sure they have a solid track record and reputation in the industry and know what they’re talking about. Also, consider what you think you need to learn to be successful and look for a program that offers that. Each program is different, and there is no one solution that will meet everyone’s needs. Here are 15 questions to ask before investing in home staging training. To find out more about a home staging career, check out Debra's website at the StagingDiva.com. Help!! Hi, I am trying to start a home staging business. I have a question. In a new construction home, did you rent your furniture in the beginning? I thought about going to the local stores and swapping advertising for usage of furniture. Obviously, I’m trying to start without. Dry much start up cost. Thanks! !